We are deeply concerned about Ofsted’s Bold Beginnings report. The report infers that reception classes should be taught like year 1. This would mean narrowing the curriculum to focus more heavily on literacy and mathematics, overly formal teaching and less opportunity for play. It asserts that “successful” schools already teach in this way. However, the report is based on visits to less than 0.25% of schools. It appears that Ofsted only visited schools where teaching was congruent with the recommendations the report would later make. Thousands of reception children make excellent progress following a broad and balanced curriculum where play is the central feature. 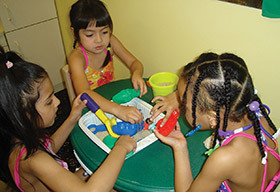 Here, children engage in purposeful activities, both adult-guided and child-led, with teachers who are highly skilled in moving learning forward. The basic architecture of a child’s brain is forming during reception year. Introducing overly formal, unsuitable teaching practices is a potential disaster for children’s learning. Education is our collective responsibility. We urge reception teachers to continue to base their practice on their professional knowledge of how young children learn best. We ask senior leadership teams to have confidence in their teachers in doing so. We call on parents and carers to advocate for each child’s right to learn through play. The government must review their plans regarding changes to the nature of the reception year. The biased Bold Beginnings report risks being used as a basis for educational policy. It is based on flawed evidence and it should be withdrawn. The Early Childhood Forum is concerned that recommendations from government ministers, who are proposing a baseline test for four year olds, and OfSTED, who have just issued a report on reception classes, appear to demonstrate that established knowledge and understanding of how young children learn are not being used to formulate policy. The strength of feeling from our members across the early childhood sector in rejecting these proposed changes and recommendations is very evident. Most other countries do not consider formal teaching of reading and writing until children are seven when they learn very quickly. What is being proposed and much of what is happening already will not only fail children at a young age, but consequently damage their progress and motivation for the rest of their education. Research is plentiful - why do Ministers and now worryingly OfSTED- not heed the research? We would very much like to hear from members with their views on the Ofsted report, and we plan to publish reactions on this website.